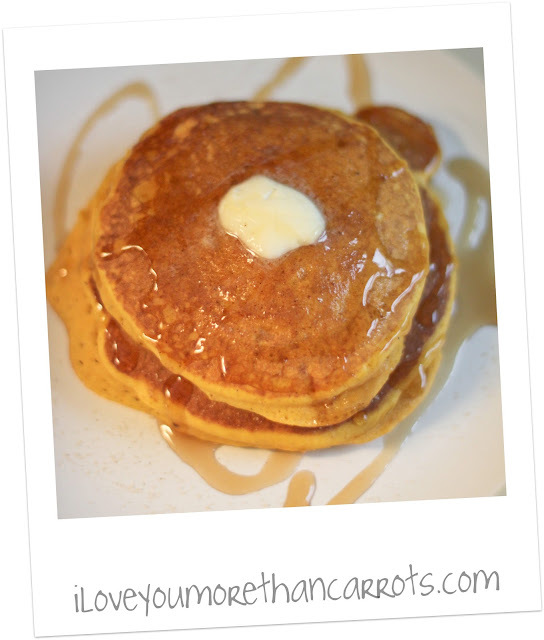 I Love You More Than Carrots: Pumpkin-spiration: Yummy Pumpkin-Spiced Pancakes! Friends, desperate times called for desperate measures. If you follow me on Twitter, you would have known the sheer devastation I felt shortly before The Husband's birthday when not one, not two, but FOUR local grocers were sold out of canned pumpkin. Talk about a pumpkin depression! I was forced to bake him a Ginger-Vanilla Loaf rather than my annual Husbandly Birthday Pumpkin Bread. Oh, the horror! So needless to say, when I saw that the local Martin's was restocking it's shelves at the exact same time I happened to be cruising by the baking aisle, I knew it was fate. I bought so many damn cans of pumpkin and it was a good thing I did! Shortly thereafter women were literally throwing elbows trying to scoop the stuff up! Crazytown. Before I share with you this divine recipe, I need to give credit where credit is due and thank my friend Aliya for not only the inspiration for this recipe but also the genius behind "pumpkin-spiration." Can you believe she thought of that before 9am? And she's a mom to a beautiful little chunker. Even more brilliant, if you ask me! Last Fall, the Husband and I enjoyed many a pumpkin french toast breakfast but after seeing Aliya post a picture of her pumpkin pancakes on Facebook earlier this week, I knew we needed to branch out. And branch out we did! Although I did not top said pancakes with homemade cinnamon-honey butter like Aliya did, I'm fairly certain my sprinkle of cinnamon-sugar goodness is near comparable. This recipe is ridiculously easy and as I'm sure you can guess, I barely measured anything and it turned out delicious. True AP-fashion, I tellya! Prepare pancakes according to directions on Bisquick box. The 'cakes we made yesterday morning were thick. We're talking really cake-y. You may want to cut back on the amount of Bisquick by say, a third-to-a-half cup, if you prefer your 'cakes to be less dense. Mix in 3/4 a can of the pumpkin. If your batter appears too thick, splash in a bit more milk. Throw your 'cakes onto the griddle, wait for those sneaky little bubbles to start popping and flip when ready! Once done, I sprinkled them with the cinnamon-sugar mix, topped with a pat of butter and drizzled with delicious maple syrup. It was like biting into a warm slice of pumpkin pie. Believe me, Loyals. You NEED to make these Pumpkin-Spiced Pancakes! And once you do? Come back and tell me how divine they were! I love pumpkin pancakes! I need to try pumpkin french toast! I may have just licked my monitor. yum yum yum :) looks so good! Yummy! I have been craving something pumpkin too lately. Thinking about making a pumpkin loaf. It doesnt seem fall without it. I totally just bought a box mix for this! so sexcited to eat them..all, but not. OOOH!!!!! I have never had pumpkin pancakes and these look SO delicious!!! I can't wait to try them out next weekend (no fancy breakfasts during the work week!). Also, I LOL'd at the pic of women throwing elbows to get to pumpkin! tee hee hee! Which of your followers revisits your blog daily (while at work) just to look at the pic of these pancakes? Oh my goodness. I'm so glad I found these on pinterest. I will be making them. Soon.